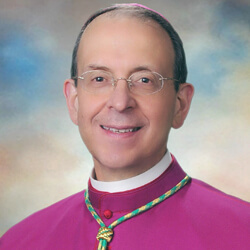 For the priestly ordination you are about to receive requires a response of love – a love that you will show by the pastoral care you will offer God’s people, a love you will manifest by your spirit of loving communion with me and with your fellow priests, by your faithful proclamation of God’s Word and devout celebration of his mysteries, and by a life of daily, sustained prayer, . . . all for the glory of God and sanctification of his people. Similarly, moments from now I shall ask if you are prepared to continue developing a life of daily prayer, centered on the Eucharist and enriched by faithfully praying the Liturgy of the Hours. Moments before you are sacramentally transformed by the Holy Spirit such that, in your depths, the identity of Christ the High Priest comes to life, I shall ask if you are prepared to unite yourselves more closely to Christ each day, . . . indeed to be consecrated in the very Sacrifice you offer, in such a way that you can make a sincere gift of self to Christ and to the people you serve. Again, in these questions, hear not my voice but the voice of the Risen Christ saying: “Do you love me?” – Stephen, Isaac, Steven, Jaime, Jason, David, and John: “Do you love me?” It is by growing in holiness, by having an interior life that corresponds to the dignity and beauty of the Office that the Church entrusts to you today, that you will answer the Lord Jesus, “Yes, Lord, you know that I love you!” Prayer is what readies us to tend the flock entrusted to us. Simon Peter was hurt because Jesus asked a third time, “Do you love me?”, yet, I urge you, dear brothers, never be hurt by that question. Allow the Lord Jesus to challenge you with that question every day of your lives. Ask Him to put that question to you in times of sorrow, in times of joy, in times of temptation, and in times of frustration, as well as in times of consolation and of accomplishment. on this day of grace that changes your lives forever.